Reviewed by Arron Clegg. Stephen King’s first foray into the realms of fantasy couldn’t really have been written any better. He manages to keep his familiar style of writing, one that keeps us turning the pages, long after the sun has set in the sky, and yet has written in an olde-worlde style that fits in perfectly with the genre. King wrote this story for his daughter Naomi after she complained to him that all he ever wrote was horror stories and that “wouldn’t it be good if you could write something for children like me”. The resulting book I’m sure you will agree, although not one of his best by any means, would have done his daughter proud. It is a classic fantasy story in every sense. Kings, princes, dragons, wizards and the fight of good against evil. 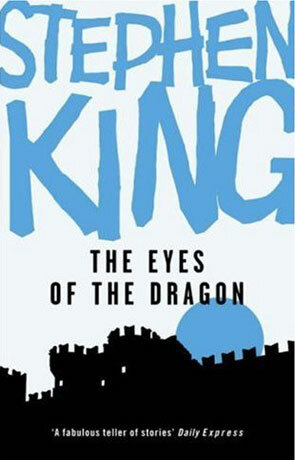 For anybody who enjoys fantasy books but has never given King a try because of his obvious horror roots should definitely give this book a try. I promise you will like it and you never know, you may find yourself reading outside of your comfort zone, so to speak. Tread carefully however, Dear Reader as the path King often treads isn’t for the faint hearted. The novel tells the tale of Flagg the king’s evil advisor and wizard who plans to bring destruction to the land of Delain, overthrow the monarchy and see the heads of the royal family sat atop spikes on the castle walls. Flagg has been seen before in King novels, his first appearance is in The Stand. The kingdom of Delain and Flagg are also mentioned in the Dark Tower series which has strong ties with this novel. In the novel Flagg who has a long term goal of mischief in the kingdom, engineers the death of the queen whilst in childbirth to the kings second son, Thomas. Grown sick of her meddling and goody two-shoes attitude, he puts things in place to get rid of her, his next step, the king himself. After poisoning him in a horrific fashion, he sets up the kings firstborn, Peter, who would rightfully be the next king, and causes him to be blamed for his father’s death. Peter is imprisoned allowing Flagg the opportunity to wreak havoc across the kingdom as advisor to the weak willed and easily led Thomas. Peter however has a cunning plan to escape and still has friends who remained true to him. With their help can they stop a monster who has been a plague in Delain for centuries? Written on 1st May 2012 by Arron.